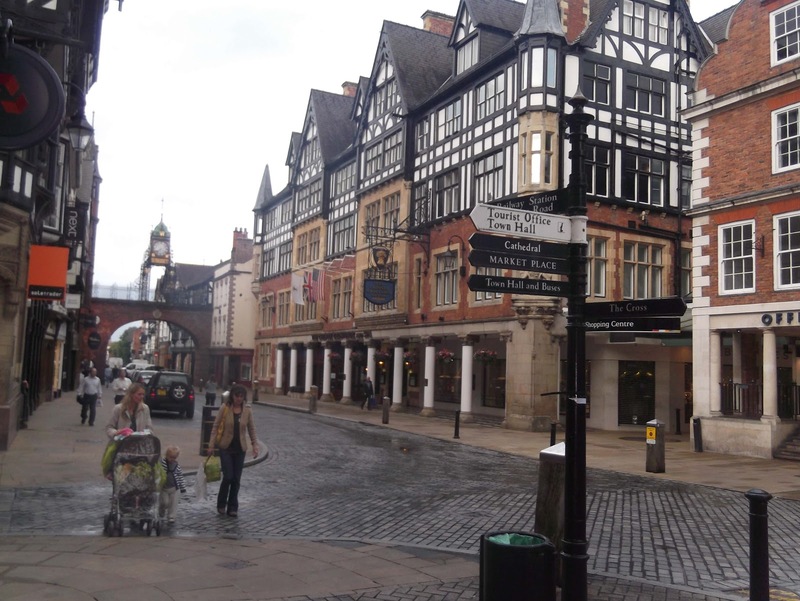 Chester, in Cheshire, is an ancient and beautiful city that is steeped in history. Tudor revival buildings and cobbled streets provide the town centre with its quintessential British charm. The ‘Rows’ that date from the medieval era (including what is believed to be the oldest shop front in England) are magnificent to walk along when browsing the town’s diverse range of designer boutiques and independent specialist retailers; the department store, Browns of Chester and of course, the big named high street stalwarts. Walking around the original city walls (the most complete example in Britain), you can see some prime examples of the town’s history from the last 2000 years: the Roman amphitheatre; the Norman castle; Georgian and Victorian buildings and canals as well as the wall itself; including the intriguingly named ‘Goblin’ and ‘Bonewaldesthorne’ Towers. If you are interested in the Roman period of history, I recommend a visit to the Spudulike restaurant on Bridge Street. I am however, unable to vouch for the potatoes but here, in the basement, you can see an original Roman hypocaust system or ‘under floor heating’. Although, do be careful if you are Welsh: an archaic bye-law states that any Welshman ‘loitering’ within the city walls after sunset may be shot with a longbow or decapitated. Following the Welsh Revolt, King Henry V passed the law, which was never repealed and still officially stands on the statute to this day (although it no longer provides protection against prosecution for murder). The Duke of Westminster and his ancestors have, for centuries, owned a substantial amount of land in and around Chester and the Duke’s family name of Grosvenor is inextricably linked with the city: The Grosvenor Museum, Grosvenor Park, Grosvenor Bridge and The Grosvenor Hotel are the more obvious connections. The hotel having been owned by the family since 1815 has always had a reputation for quality. 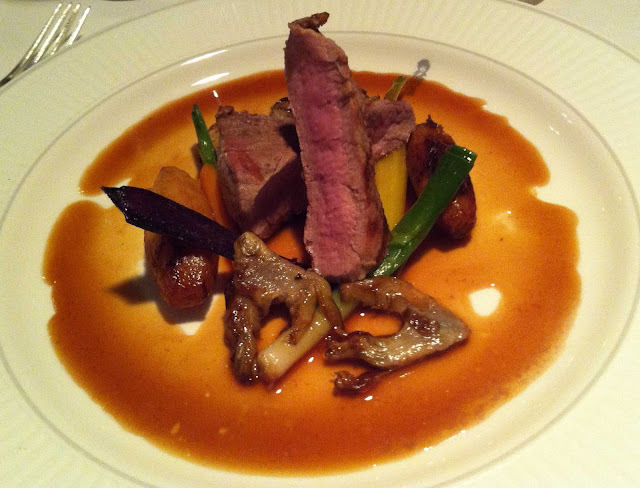 The hotel’s restaurant, Simon Radley at The Chester Grosvenor, is one of only four in the country to have held a Michelin star for over twenty consecutive years (The other three being: The Waterside, Le Gavroche, and Le Manoir aux Quat' Saisons). The restaurant was previously known as ‘The Arkle’ after a famous racehorse owned by Anne, Duchess of Westminster but was renamed and restyled in 2008 in honour of the Chef that, for such a long period of time, has been so influential in its success. The legendary horse had a short but celebrated career in the sixties, winning the Cheltenham Gold Cup three times before retiring early due to injury. The equine connection can still be seen in the many works of art that decorate the restaurant’s comfortable Arkle Bar and Lounge area. To learn more about the town’s history, the Grosvenor Museum, on Grosvenor Street, is a great place to head. As is, The Dewa Roman Experience, which has hands-on exhibits and a reconstructed Roman street. Naturally, being a foodist, I was keen to find out what the Romans ate: discovering that the food had many “similarities” to what we ate, that evening, as part of the Tasting Menu. The poorer Romans mainly ate bread, soup and porridge. And after our tasty amuse bouche of White bean mouse with minted peas; Parmesan Gougères with cream cheese and spring radish; Ham hock jelly with crispy bacon and Grissini, which we ate in the lounge, we were shown into the dining room and presented with a trolley of the most fabulous breads that I have ever seen in a restaurant. Poor people's small wooden or mud brick homes didn’t have kitchens. So they often took food round to the baker, to cook in his oven. Our breads, freshly made by ‘Barry the Baker’ (who, to me, sounds like a character from a Guy Ritchie movie) were excellent. The choices, which I greedily eagerly worked my way through over the first few courses were: Sourdough; French Baguette; Stoneground Farmhouse; Bavarian Rye; Lancashire Cheese and Onion; Boddingtons and Mashed Potato; Fig and Walnut and Cottage Granary. Sourdough is always a favourite of mine and this one did not disappoint. The real star however, was the Boddingtons (a nod to the Chef Radley’s Mancunian roots?) and Mashed Potato bread – beautifully moist with a subtle malty flavour. 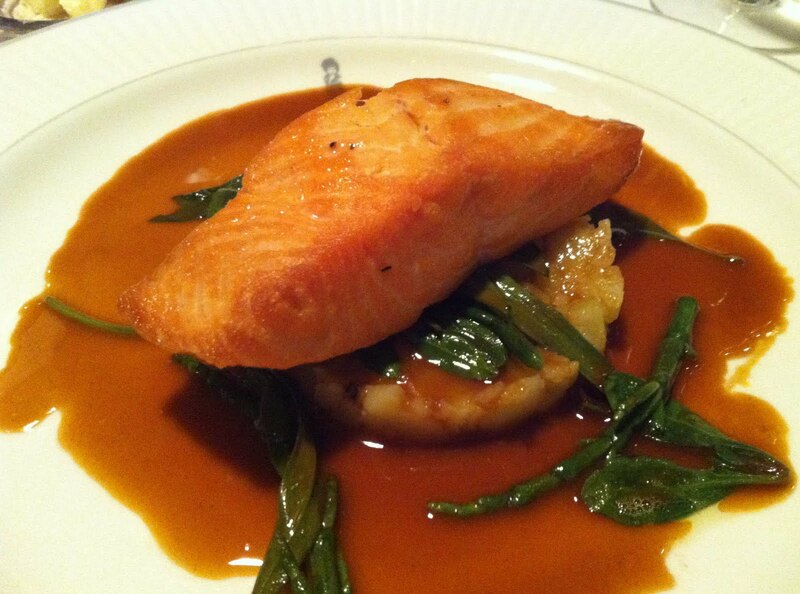 Although the Romans would have regularly eaten soup and salmon, from the River Dee, I am sure never with the refinement of the next course. 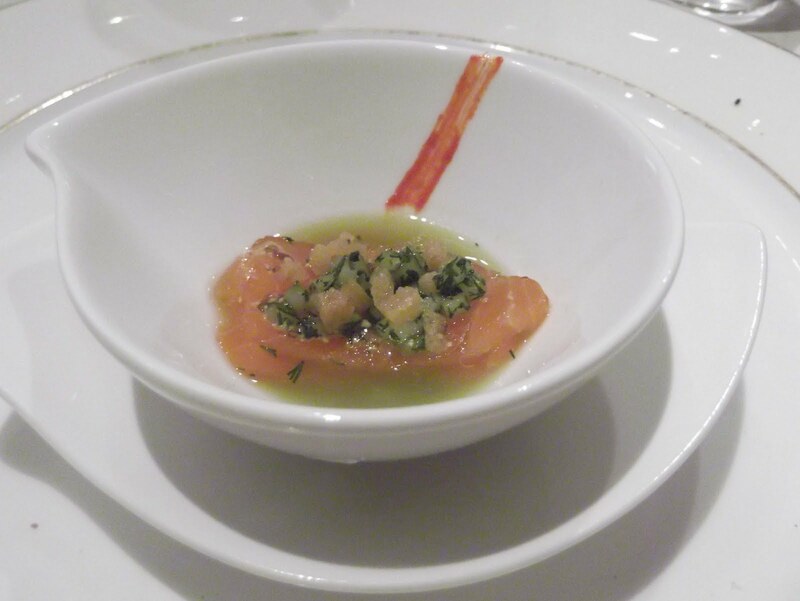 Simply, with the Chef’s typical understated restraint, called Amuse - a clean tasting cucumber gazpacho, with delicately pickled salmon and a little crunchy texture from delightful miniature croutons. For ordinary Romans, meat was a luxury, unless they lived in the countryside and could go hunting or fishing. The next course certainly was luxurious (and my favourite of the evening), called Composition - Native lobster, sweetbread bonbons, girolles and summer pea. The girolles had been pickled prior to cooking and added a lovely acidity to the dish. The batter on the ‘bonbons’ was delightfully light and crisp. 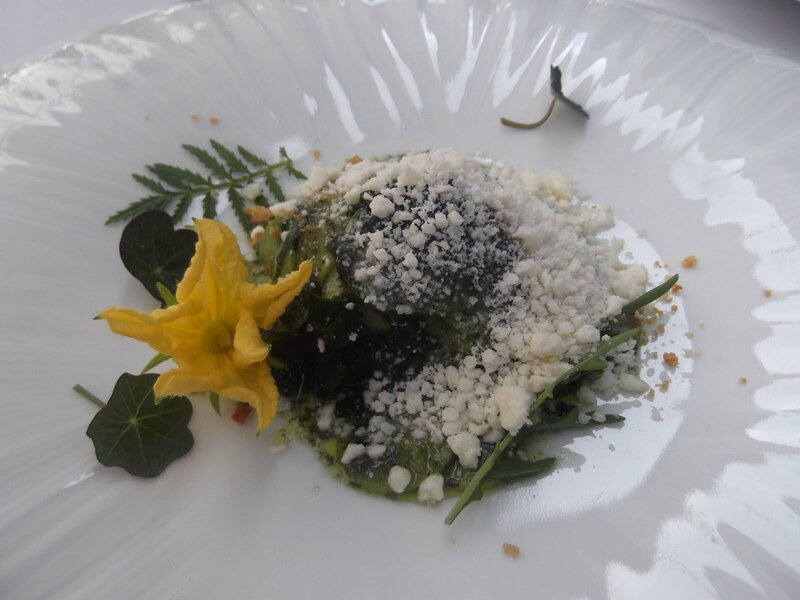 The next dish was Morue - creamy salt cod ravioli with local nettles and flowers. Ancient Romans, despite their ‘Italian’ origins would not have had ravioli; Roman soldiers did however bring their own nettle to the British Isles. I don’t know if they ate them, but they did use them during long, cold and wet marches, to stimulate circulation on their tired and pained legs, using a practice called ‘urtification’. Personally, if they are going to be prepared with the skill and creativity of Simon Radley, then I’d rather stick to eating them. Richer Roman ‘citizens’ had food cooked at home in the kitchen by slaves. 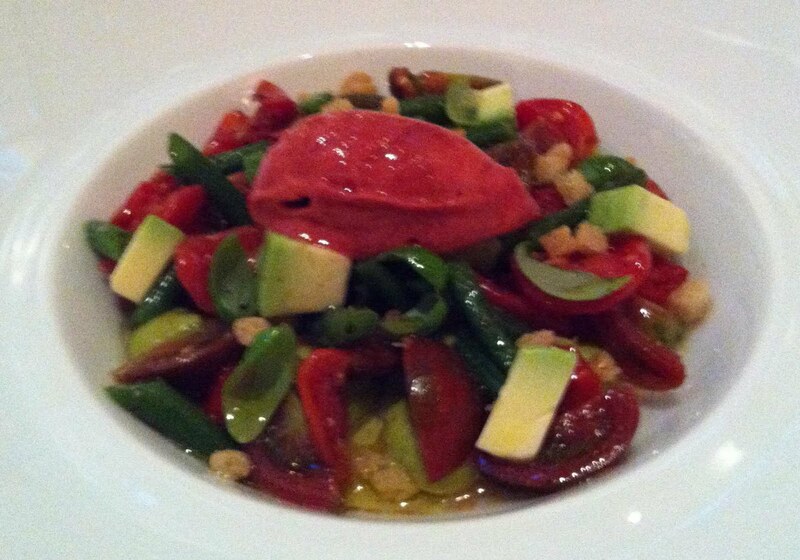 They ate dinner in late afternoon, with a starter, a meat course followed by fruit or nuts. 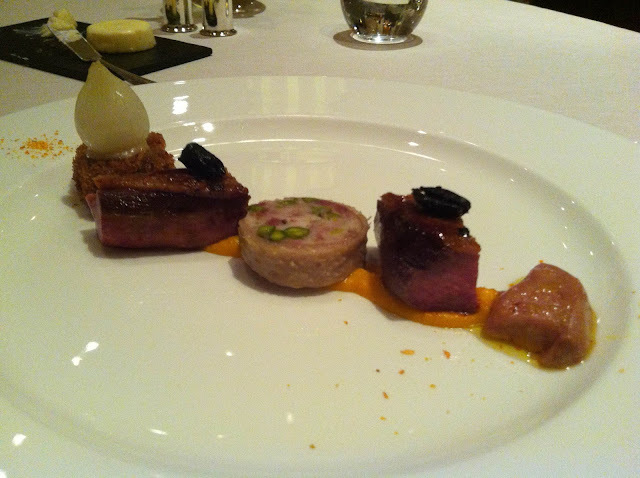 Our meat course was Landaise duck breast with Stuffed neck salami, crispy rillette, fondant liver, and olive. The neck salami was stuffed with pistachio nuts, which provided a great texture variance. The duck rillete kromeski was full of flavour and delightfully crunchy. My only criticism was the duck was a little too chewy for my taste. The lightly sautéd duck liver in olive oil was sublime. 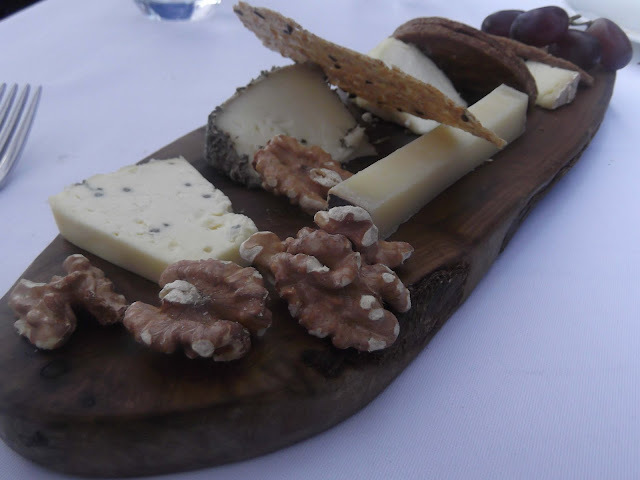 We followed our meat course with cheese from the board as an alternative to the Crumpet - Fig and apricot, organic Cheddar listed on the menu. The cheese and condiment selection at Simon Radley is superb. Romans would serve lettuce at the end of a meal, believing it helped them to sleep. Fortunately, instead of a salad leaf, we were served Trifle. A refreshing palate cleanser consisting of an elderflower jell, concealing a delicious plump gooseberry. The Romans certainly had gooseberries, as mentioned by Pliny the Elder in his book Naturalis Historia published circa AD 77-79 (around the time of the Roman’s arrival in Chester). 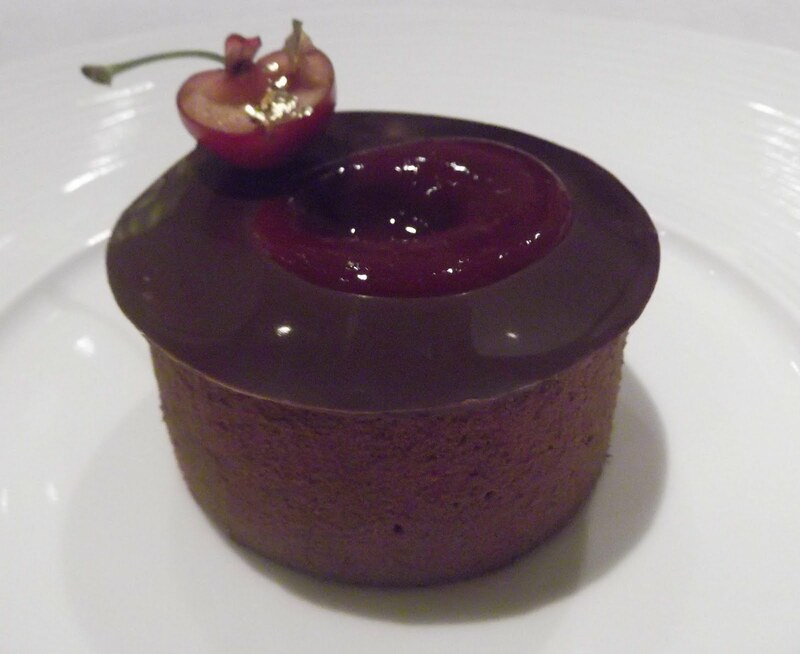 The final offering on the tasting menu was Forét Noir - Caraibé chocolate textures, warm cherry. 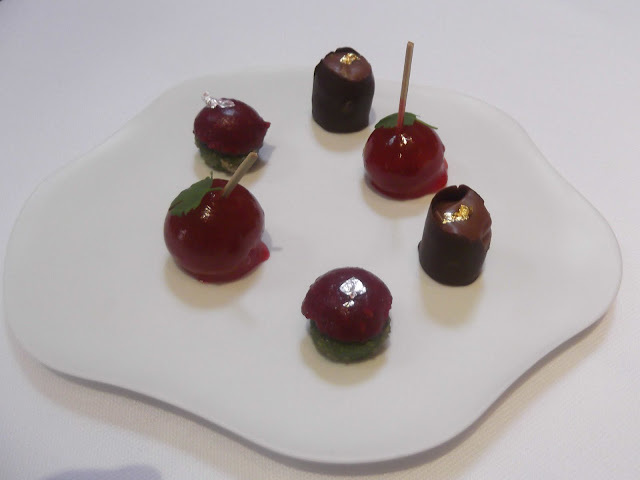 An imaginative and innovative take on the classic pudding – it was tantalising to watch the thin disc of tempered Caraibé chocolate melt and sink as the warm cherry sauce was poured on. The ‘cherry on top’ was a cherry on the top made more lustrous by a slither of gold leaf. To finish the evening, we returned to the Arkle Bar and Lounge for another Italian import, an espresso; served with a fantastic selection of petit fours: dark chocolate truffle, cherry jelly, popping candy rice crispy cake, banana and passion fruit macaroon, strawberry lollipop, lemon cannelloni, honeycomb, chocolate cornflake cake, raspberry financier, nougat, marshmallow, pistachio puff, citrus sorbet. So there we have it; I’m sorry if you clicked onto this blog expecting to read about food and ended up with a history lesson. If that is the case, I’ll summarise for you: Simon Radley at The Chester Grosvenor is a magnificent restaurant and well worth visiting. However, when you think a little harder you soon realise that, working in some of the World’s greatest restaurants, there is a plethora of hugely talented Australian chefs. Peter Gilmore’s Quay, Ben Shewry’s Attica, Tetsuya Wakuda’s Tetsuya’s and Mark Best’s Marque all feature in the S.Pellegrino list of the World’s 100 Best Restaurants. Whilst in Singapore, I recently had the chance to meet, albeit briefly, another brilliant Australian chef, Brent Savage of The Bentley. 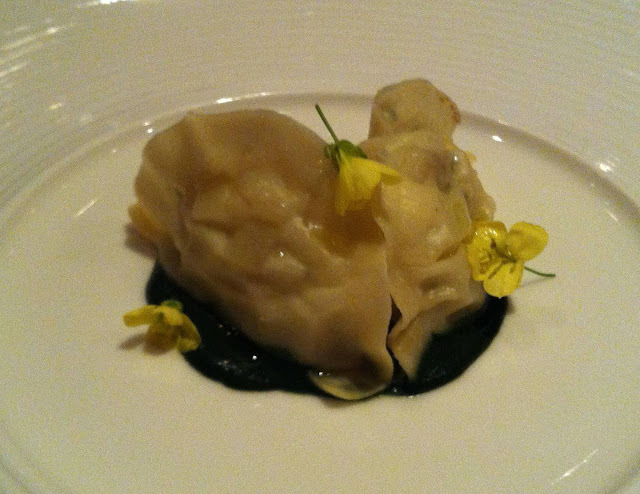 Brent was in Singapore as guest of Ryan Clift, as part of the World Gourmet Summit. 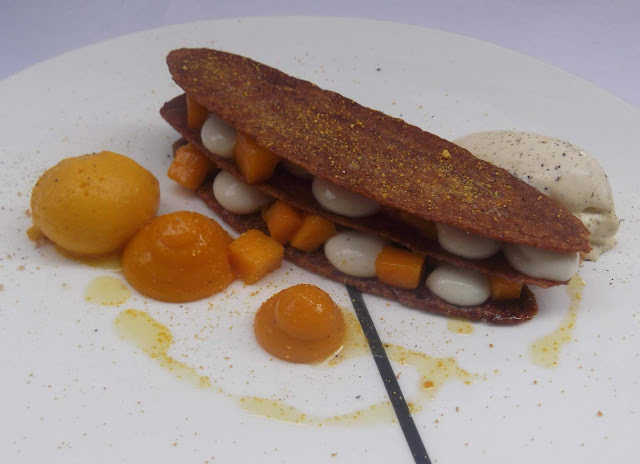 Ryan is the enormously talented young British chef in charge of The Tippling Club - he trained with Marco Pierre White, Raymond Capaldi and another Aussie, Shannon Bennet of Vue de Monde, the only antipodean offering in Les Grande Tables du Monde. Of course, the successful Australian version of Masterchef has also added to the perception of the country as being one of the most exciting gastronomic destinations on the planet. If you are not planning a gourmet trip down under, Brent and Shannon both have excellent cookbooks, which are well worth checking out. As are Bill Granger’s; another chef from down that way, who is popular in the UK. 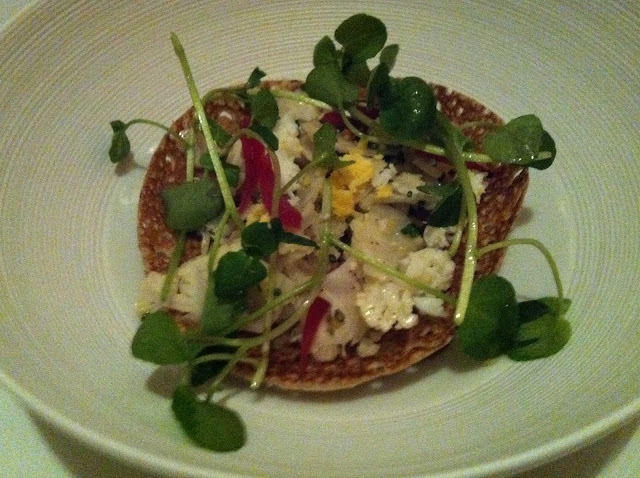 London also has a rich history of top Australian chefs working within some of its finest kitchens and foodie haunts. Before he went on to become head chef at Pierre White’s Quo Vadis (pre Sam and Eddie Hart days), Curtis Stone honed his skills working with Marco at the Café Royal and Mirabelle. MasterChef’s John Torode oversees Smith’s of Smithfields and other successful eateries. Paul Merrony, who trained with the Roux brothers, now runs the famous Giaconda Dining Room on Denmark Street, a longtime holder of a Michelin Bib Gourmand Award. On the subject of Michelin, David Thompson of Nahm was the first chef to gain a star for a Thai restaurant, a place which is high on my ‘to do’ list. 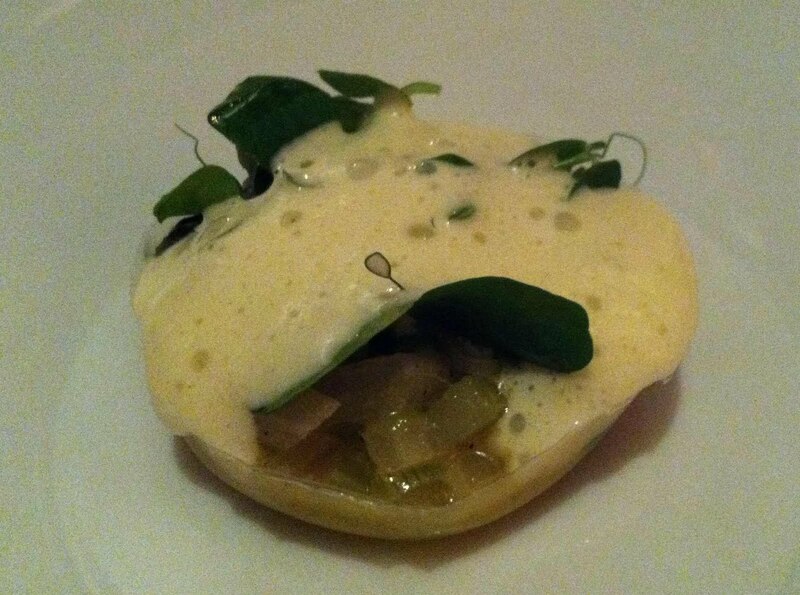 Two places, which that have now been ticked off that list, are Shane Osborn’s Pied à Terre, which we went to last year and, the subject of this blog post: Brett Graham’s The Ledbury. Interestingly, of the eight London restaurants with two stars, three have British chefs, three have French Chefs and two have Australians running the pass. The Notting Hill based ‘The Ledbury’, which at number 34 was the highest new entry in the Restaurant Magazine’s 2011 S.Pellegrino list of the World’s Best Restaurants, has had a real buzz about it for some time. So, it was to The Ledbury on a sunny June morning, after being picked up from our hotel by my good, London Cabbie pal, Richard (who was best man at our wedding) that my wife and I headed for one of loveliest lunchtime’s of our lives. Felling in high spirits from having just caught up with an old friend, we were greeted warmly by the Ledbury staff and were offered the chance to take our lunch in the dining room or outside. Taking advantage of a rare spell of sunshine in the otherwise overcast week, we decided to go al fresco. So far, a perfect start to the day that could only be made better with equally perfect food – suffices to say, we were not disappointed. 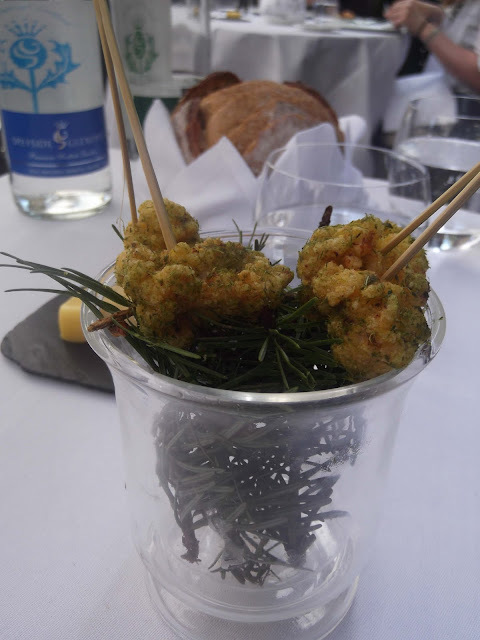 Our amuse bouche consisted of the perfect Foie Gras and Ginger Parfait and crispy nuggets of Rabbit, cooked with a buttermilk and courgette crumb, served over aromatic pine needles. 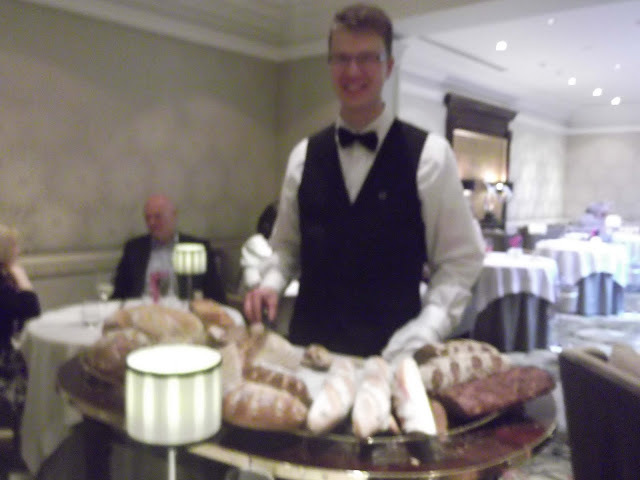 The breads that were served were exceptional: The Sourdough (a usual favourite of mine) was full of flavour and fresh from the oven. The Crystallised Malt was also very good. The real star however, was The Onion and Bacon Brioche – I’m not sure how many I had, but there was no way I was going to turn one down… and they did keep offering! 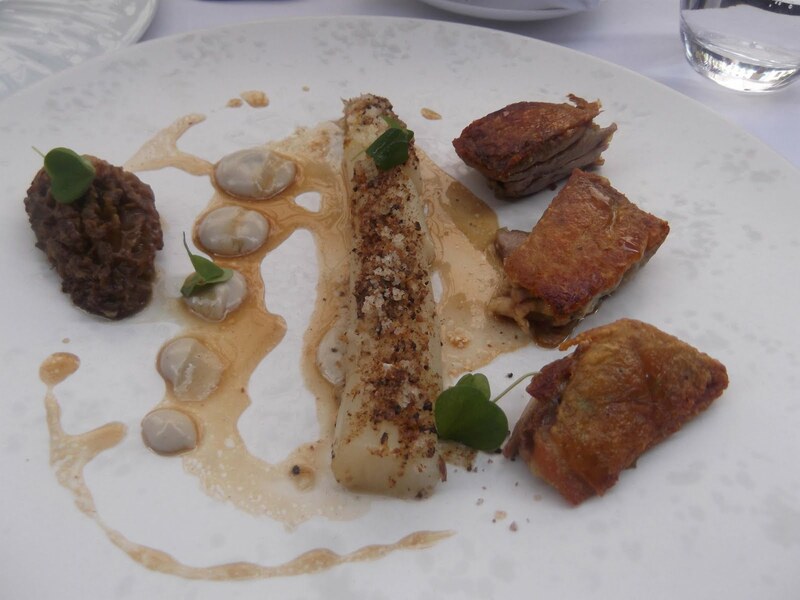 To start, my wife opted for the Crisp Guinea Fowl with White Asparagus, Arbois and a Stuffed Morel – the same combination of white asparagus, Arbois wine and a deliciously plump morel that we had a Sketch, but this time accompanied by three tasty pieces of crisp guinea fowl. My choice of starter was Thinly Sliced Courgettes with Hand Picked Crab, Wakame Oil and Frozen Parmesan – the refreshing parmesan snow sprinkled on the fresh green hues of the leaves and courgettes and topped with a vibrant canary yellow flower made this the perfect choice for enjoying in the sun. 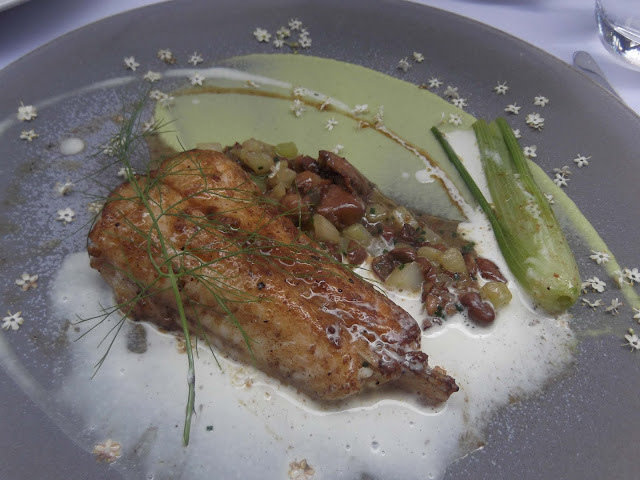 My wife’s main of Roast Monkfish with Wild Fennel, Elderflower and Mousserons was, a visual work of art; the delicate elderflowers delightfully dotted around the stone-grey plate. 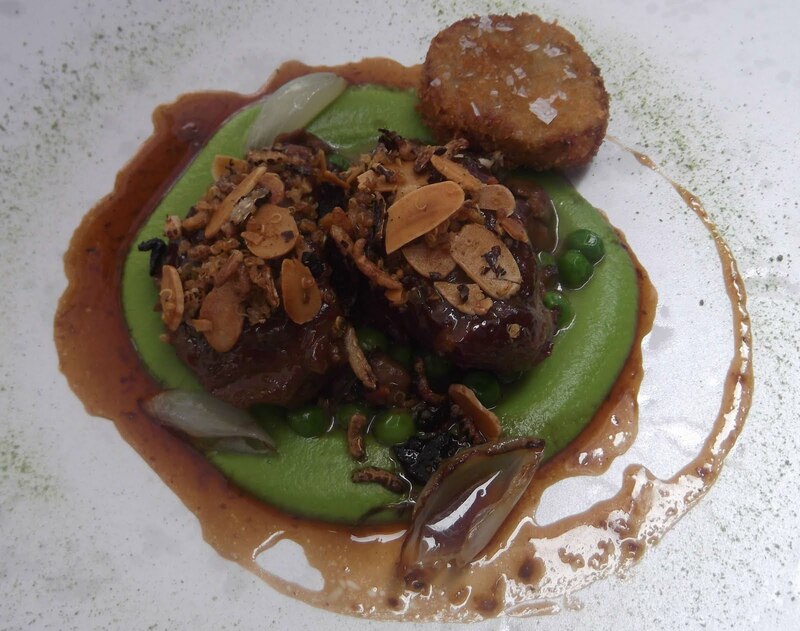 My main was Pork Cheeks Cooked in Pedro Ximénez with Peas and Black Pudding – as expected, the pork cheeks were fantastic; a welcome surprise, not given away by the menu description, was the salty pork kromeski and the toasted almonds, grains and puffed rice, that added a cracking crunch to the whole dish. My wife’s beautiful looking (and of course, tasting) dessert was Caramelised Puff Pastry with Mango, Black Pepper and Olive Oil - packed full of fresh fruity flavour. 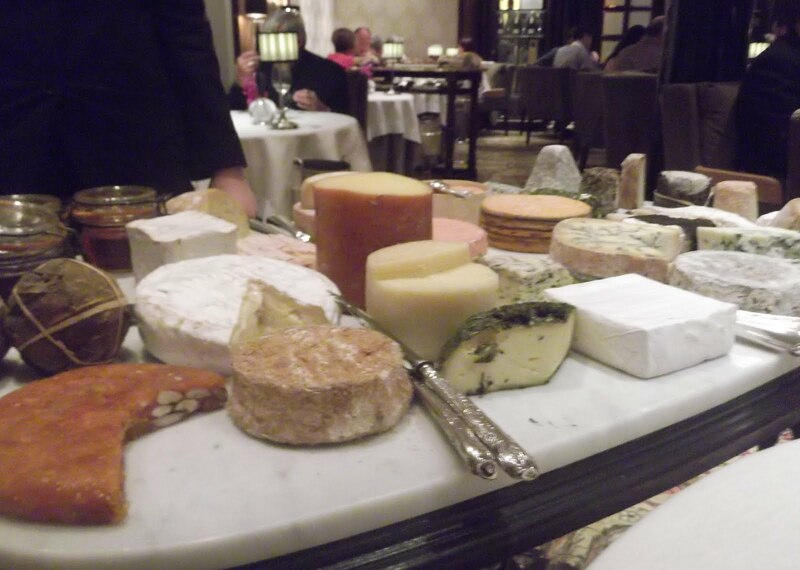 As usual, I went for the Cheese from the Trolley – a great selection of top quality cheeses. 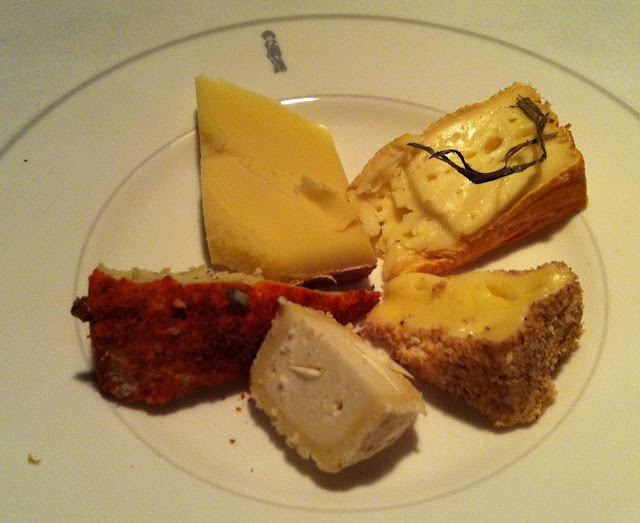 I chose four favourites: a creamy Bavarian Blue, an earthy Gruyere Alpage, a fruity and mildly nutty Morbier and a tangy Munster from Alsace. 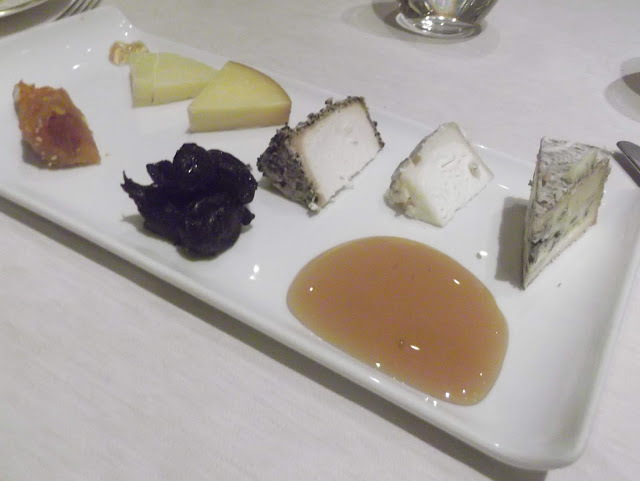 My final choice, featuring a rind covered with rosemary and aromatic herbs, was one that I had not previously tasted; a semi-soft sheep’s milk cheese from Corsica called Fleur de Maquis – a subtle nutty taste (although, a bit more than the Morbier) and a meltingly soft texture. 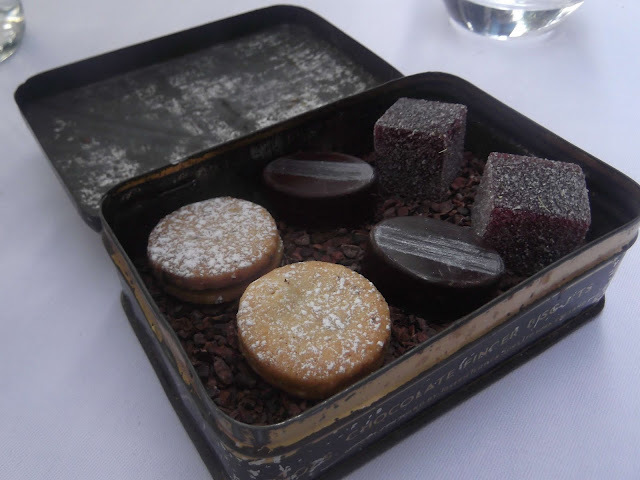 The Petit fours were served in quirky antique biscuit tins. The Hazelnut Sablé was sublime but the summery taste of Raspberry Jelly was the perfect way to end a meal sat outside in the London sunshine. 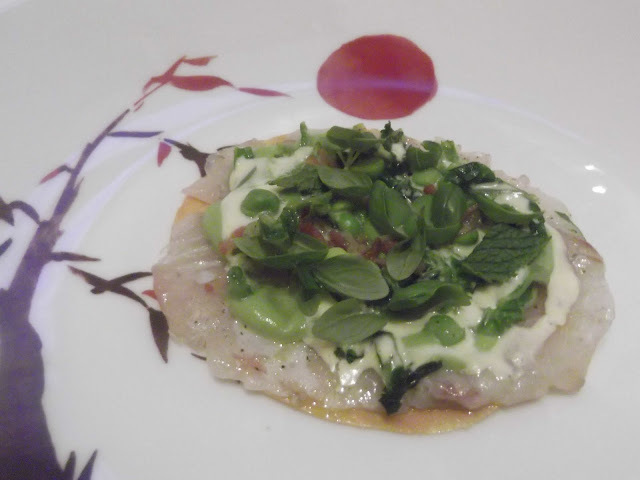 So now if someone asks me about Australian food, I will not be thinking about Paul Hogan and his barbequed shrimps; I’ll be thinking about Brett Graham and The Ledbury and telling them about a truly bonza lunch. Sketch was so good - we went three times on the same day! Let me explain… We only usually get down to the capital, once or maybe twice a year and when we do, we like to make the most of it by eating in as many of its top eateries as we can, or more precisely, as our budget allows. 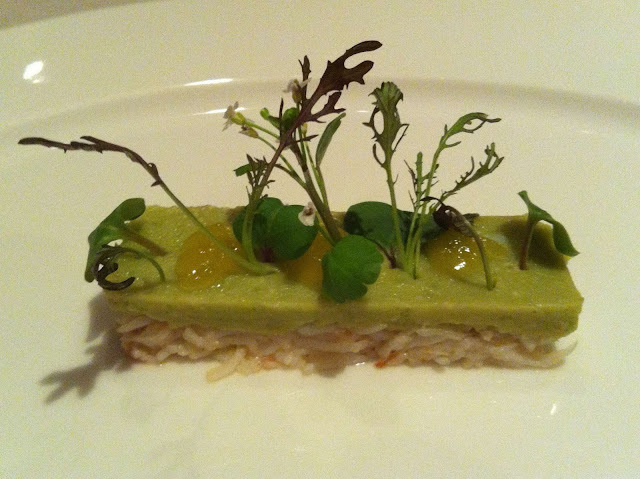 Pierre Gagnaire’s London outpost has long been on our ‘to do’ list. Partly because of the extraordinary reputation of the ‘Godfather of Molecular Gastronomy’ and partly because the pictures we have seen of the dining room and decor make it look ‘right up our alley’ style wise. So, when our lunch exceeded our high expectations we decided to go for a little walk and then go back for afternoon tea. We opted to take our tea in ‘The Glade’ as it was quieter than the usual ‘Parlour’. 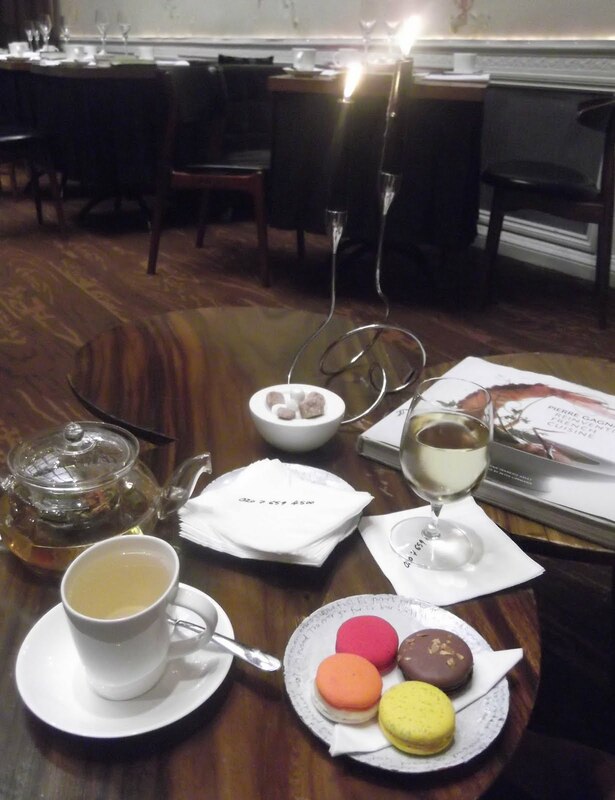 I love macaroons and of the four flavours on offer (Lemon and Basil, Rhubarb and Strawberry, Apricot and Almond, Chocolate and Caramel) the rhubarb one was definitely my favourite. The ‘Jing’ Japanese Sencha Green Tea was also very good and served at an appropriate temperature, which disappointingly is not always the case, even in the finest of restaurants. Over tea and a macaroon we fell in love: with each other all over again… and with Sketch. We hatched a plan to return for dinner next year but we could simply not wait that long, that’s why we booked for the evening! 9 Conduit Street, the Grade II Georgian townhouse where Sketch is housed, has a rich and varied history. If you are interested, it’s definitely worth Googling – or better yet, as we did, ask one of Sketch’s superbly friendly staff, such as front of house supremo David Kyle-Boyd to give you the grand tour and history lesson. It is great to be greeted by a host with such a genuine verve and enthusiasm to share his passion with guests. When I am writing a blog post about a restaurant, I usually like to throw in a line or two about the décor, but with Sketch I could write two pages and still have only described the entranceway and reception area. Each of the rooms, individually designed, styled and bejeweled by the creative minds of restaurateur Mourad Mazouz, Pierre Gagnaire and a select group of emerging and acclaimed artists and interior designers, possess their own individual, yet harmonious vibe. Every aspect of the interior, from the original Georgian features; the evidence of the building’s previous occupants and Sketch’s additional modern embellishments are a visual delight. Sketch is the only restaurant where I have actually been excited by the toilets! Check the website. Look at the pictures. Believe the hype! A meal at Sketch satisfies all the senses. ‘The Gallery’ by day is a large gallery like space doing exactly what it says on the tin. By night, it is transformed into a hip and buzzing sensory attack of a restaurant. Still and moving images are projected 360º onto the walls. The soundtrack is hip. The clientele is hip. The atmosphere is buzzing. Everything is hip and buzzing and so wonderfully overwhelming… Is it still ‘hip’ to use the word hip? To gain access to the Michelin Starred Lecture Room and Library (named after the room’s previous use by the Royal Institute of British Architects), you are led behind a red rope and up a dark ‘blood covered’ staircase, which, on reflection seems a little odd, but at the time is just one of the stimulating ‘arty’ superfluities that invade your senses. 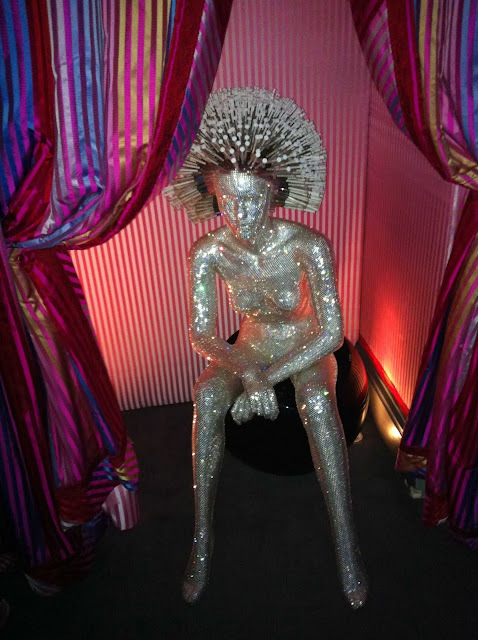 Another, waiting at the top of the staircase, sat a striking mirror-balled mannequin sporting a spiky ‘fro, formed from hypodermic needles. 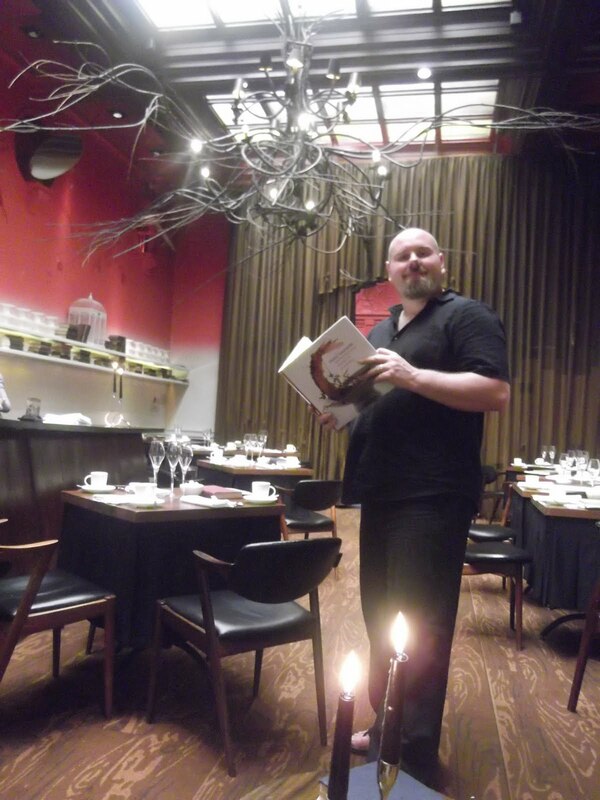 As interesting and inspiring as the art is, Sketch is first and foremost a restaurant and when the heavy wooden doors were dramatically swung open by David, our host, the most gorgeous and sumptuous dining room that I have ever seen lay before me. During ‘The Restaurant Inspector’ last night, it was discussed about how ‘less is more’ in a dining room and repainting the walls of the featured venue with white paint and muted colours. Sketch ignores these rules, with spectacular effects. If I was to describe the oranges, pinks, reds and yellows of the soft furnishings; the similarly coloured swirling and geometric patterned carpets and the wall coverings as being studded ivory leather, broad yellow bands and mirrored gold tiles, then you would probably imagine a garish and kitschy space with style over substance. The thing is, Sketch is garish, Sketch is kitschy but it has, in abundance, the style and the substance! 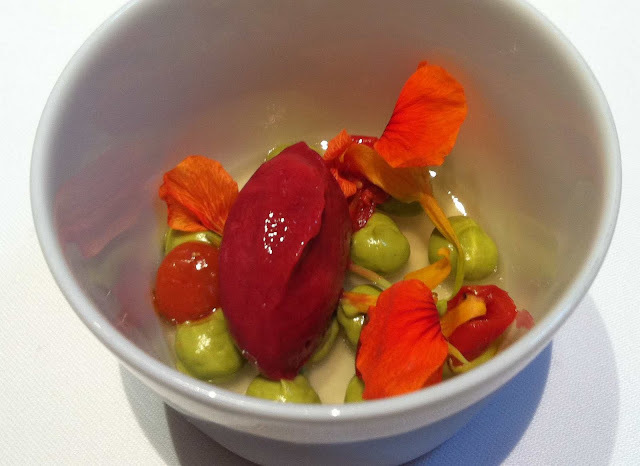 Not many restaurateurs could pull this off; not many Chefs could pull this off; not many cities could pull this off - But Mazouz is not just any restaurateur, Gagnaire is not just any Chef and of course London is not just any city. Together they have created the most spectacular space to showcase the most fabulous food. Both the lunch menus and the evening’s tasting menus started with the same amuse-bouches; which was great because at dinner I knew which ones I preferred and could save the best until last - First, I ate the Parmesan Sablé with Red Pepper; followed by the Rocket Financier; then the Seabass Sashimi with Melon, wrapped in Seaweed; saving the Goats Cheese Cream with Colombo Meringue for last. Each of them offered interesting flavour and texture contrast and showed off the chef’s delicate touch and technical skills. However, it was the subtle spicing and crumbly texture of the beautiful orange medallion of meringue coupled with the mildly tangy, creamy goat’s cheese was just delightful. 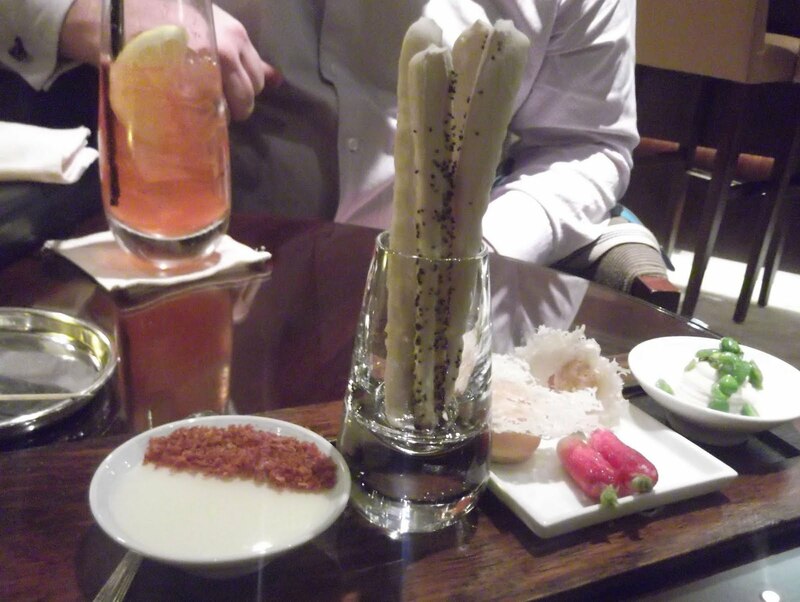 Also served as amuse-bouche were Nopli - Crunchy Vegetables with Cuttlefish and Sesame Seeds and Cumin Crackers with a White Artichoke Cream. 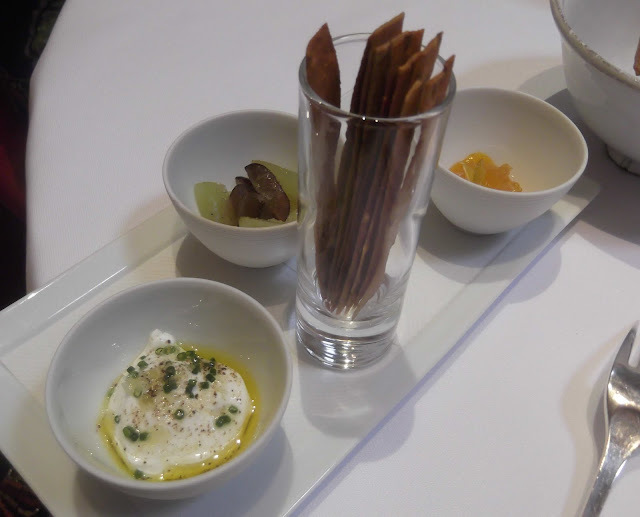 Excellent appetisers that certainly whet the appetite for the main events. The lunch menu came with a combination of four starters. 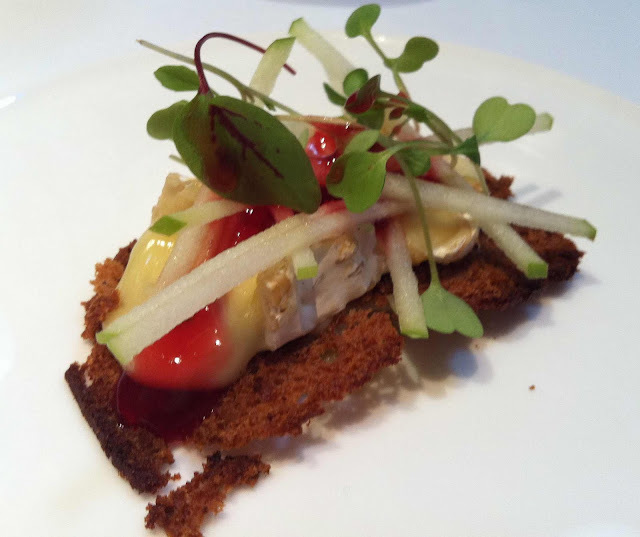 The Brie / Gingerbread / Apple / Beetroot Syrup was excellent. The heat from the ginger and the sweetness from the syrup worked fantastically well with the Brie. 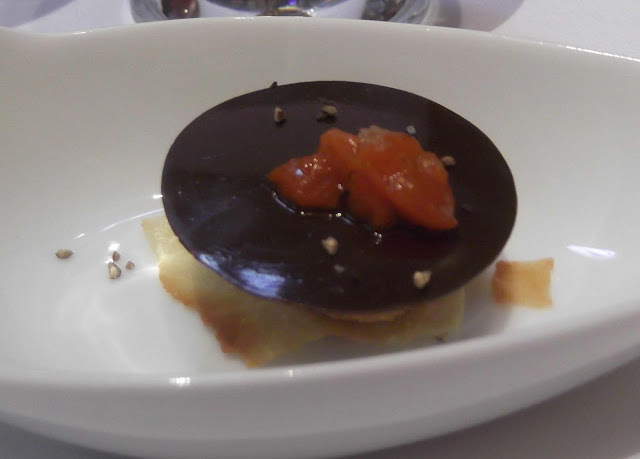 The Foie Gras / Red Pepper / Chocolate / Pane Carasau was phenomenal. Of the two of us, my wife is the bigger Foie Gras fan, but the red pepper, wafer thin crisp breads and disc of bitter chocolate really took it to another level. 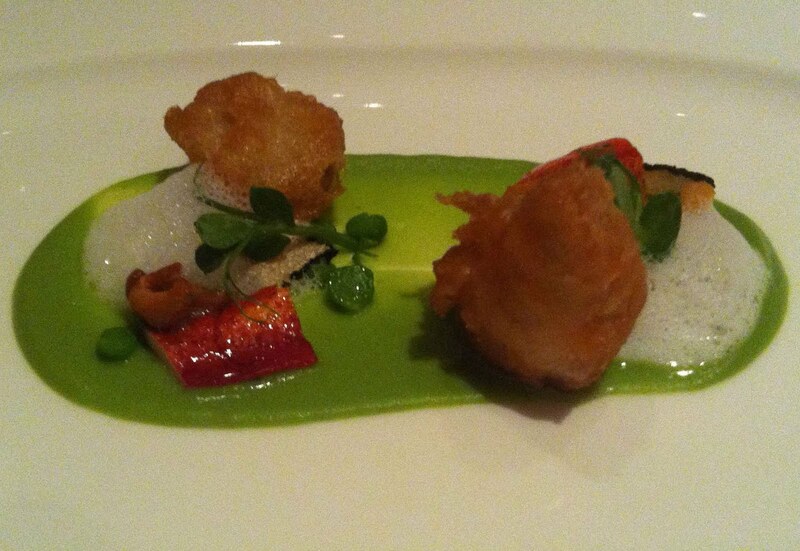 In the evening my wife chose to have the Tasting Menu, whilst I opted for the Vegetarian Tasting Menu. 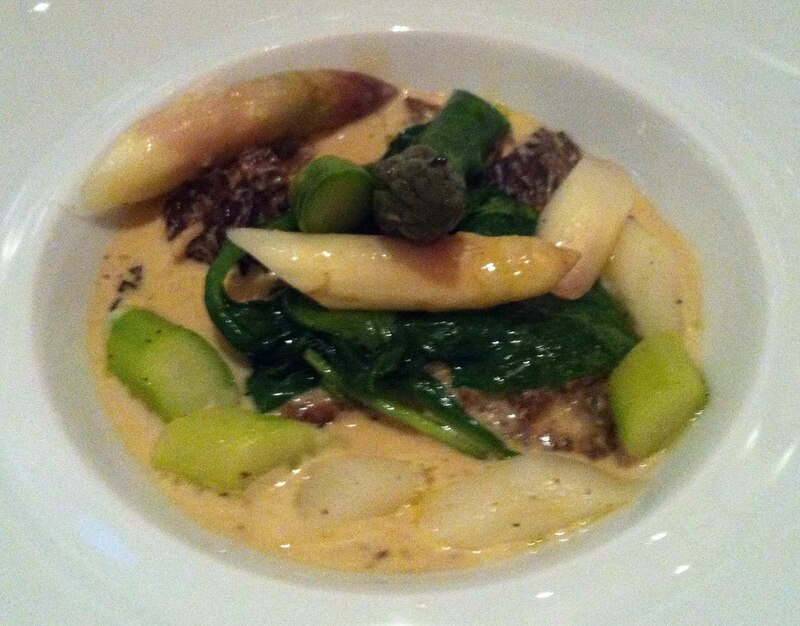 I am not vegetarian, but was swayed by the Morel and Asparagus and Heart of Mayfair dishes (and I knew my wife would give me a taste of all of hers anyway). 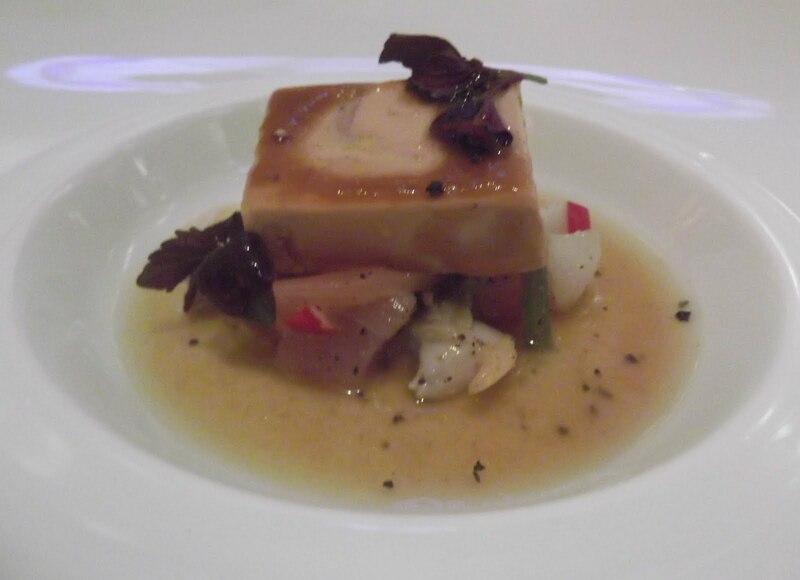 The Foie Gras was my wife’s favourite. However, of the tasters that she kindly gave me the stand out dishes were: the Stone Bass, which was so light and summery with a beautifully balanced smokiness from the lardons, and the Scottish Lobster – the tropical twist of the banana and mango bisque sauce, undercut with the warming ginger tricked my taste buds into thinking that I was sat eating this overlooking the Caribbean sea. Tomato – the greens and reds were so vibrant; the avocado and tomato so fresh and flavoursome; and delightful textures were provided by the crunchy French beans; the clear, fragrant tomato water jelly and the intensely refreshing sorbet. A lovely summery celebration of love apple! Morel and Asparagus – morels and asparagus are two of my favourite ingredients and late Spring sees them at their best; the pairing of the stronger flavoured, green asparagus and the more tender, slightly sweeter white asparagus was sensational. The rich Arbois wine bringing out the best from the earthy morels. (For an easy dish to prepare at home, try steaming some morels in Arbois wine and serving them on some asparagus spears – a simple recipe using two seasonal ingredients, it will be tasty but will pale in comparison to Gagnaire’s fine dining version). 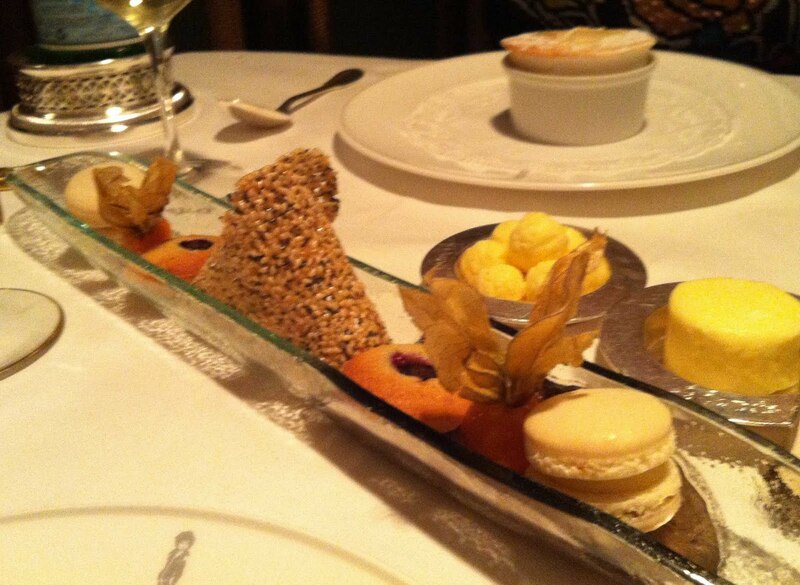 Both Tasting Menus ended with Pierre Gagnaire’s Grand Dessert - A Combination of Five Desserts and Petits Fours. 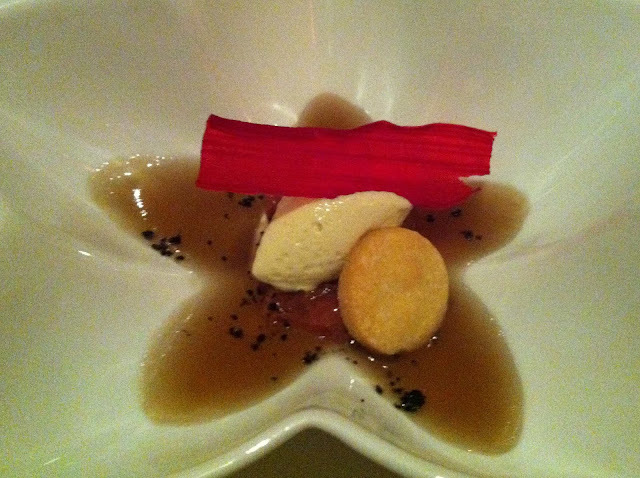 Each was indeed a ‘grand dessert’ – the grandest one in my eyes however, was the rhubarb dish. Sure, the ‘Strawberry Coulis’ tasted better but the flavour combination of Rhubarb / Black Olive Jelly / Shortbread / Mousseline Cream was enjoyably different. At lunchtime I opted for the Cheese Selection from Maison Mons, Roanne - with Sarasson Cream / Mostarda di Cremona / Crackers / Grapes Seasoned with Olive Oil and Maldon Salt. The Grapes were a triumph and something that I will definitely be trying to recreate. On our way out we noticed that Sketch is open from 8:00am for Breakfast – maybe next time we’ll go for the four meals and make a day of it! The Routemaster Bus, the Fender Stratocaster Guitar, the Aga Cooker, Levi 501 Jeans, the Supermarine Spitfire and Converse Chuck Taylor All-Stars - a list of classic design icons that could go on and on. The best of their kind? Perhaps so… or maybe not? After all, Chris Hoy does nae ride a Raleigh Chopper! One thing they do all share however is the status of being absolute design icons. Classics. They each have an enduring quality - an excellence. They have stood the test of time and hold a permanent place in our hearts. The originals. The innovators. The trendsetters. You can see where I am going with this, can’t you? 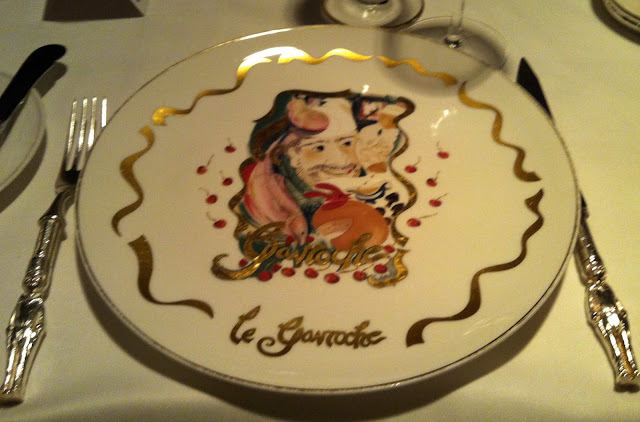 There is one more that I must add to the list - Le Gavroche. Of course, there are restaurants now in London with more stars and higher rankings in the Pellegrino list – there are restaurants that serve more technical and progressive food – there are those with more modern, lavish and breathtaking dining rooms and settings - but there are few restaurants that can boast the pedigree and heritage of this most influential and iconic Mayfair institution of gastronomy. What can I possibly write about this celebrated colossus of cuisine that has not been already written? 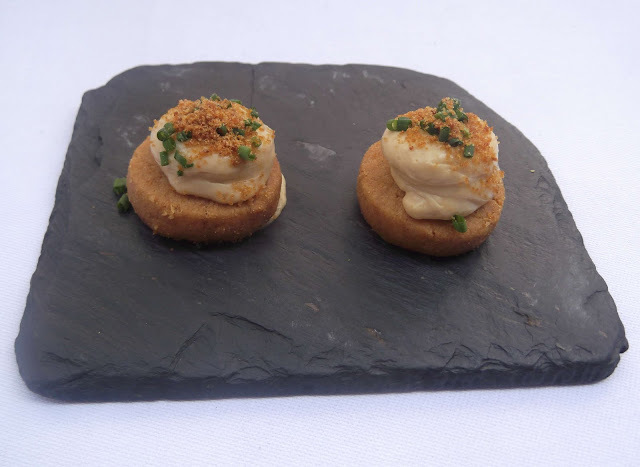 You will know that Michel and Albert, the legendary Roux Brothers opened it 1967. You will have read that it was the first establishment in the UK to be bestowed one, and then two and then three of the coveted Michelin stars. 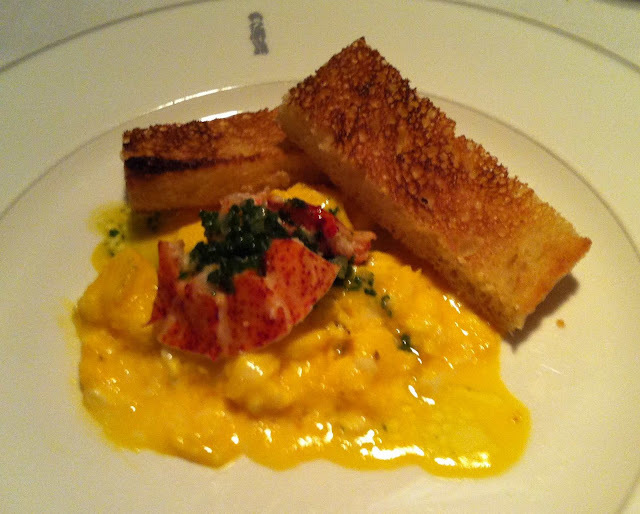 You will be aware that Marco Pierre White, Philip Howard, Marcus Wareing and Gordon Ramsay all trained there. 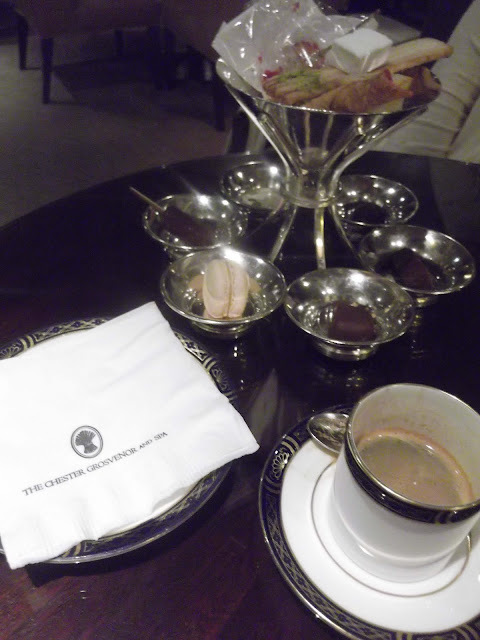 The only London restaurant in Les Grande Tables du Monde. 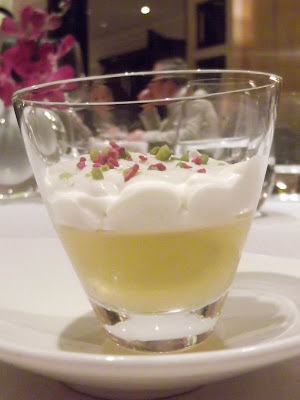 And, we all know it is now in the superbly skilled hands of the master of the professional master-chefs, Michel Roux, Jr.
Booking a Michelin starred restaurant always makes me feel special, but when I booked Le Gavroche I felt more that that – I felt honoured. Privileged. 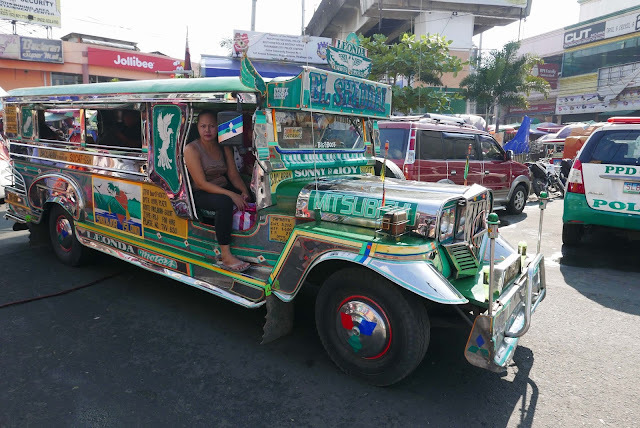 Then, after much anticipation, as our taxi dropped us outside the famous address, those feelings came flooding back. A quiver of excitement travelled through me as I looked up to behold the sign above the door, and thought of the glitterati that have graced the grand gabled doorway. The splendour continued, as we were welcomed into the lavish and elegant bar area. The plush red walls, oak furniture and artworks are delightfully dated – like those in a stately home. As we descended the stairs to the dining room, the opulence and magnificence came into it’s own. The low ceiling reinforced the ambience of an exclusive Gentlemen’s Club. Adorning the walls, original works by Picasso, Chagall, Miró, Giacometti and Dalí aspire to feed your mind as effectively as the artists in the Roux kitchen feed your appetite. As we took our seats, I was excited to note that sitting on the next table was the mighty Albert Roux himself. His presence and aura as the head of the Roux Empire and as a person was immense. It was great to imagine what may have been going though his mind as he sat, surveying this restaurant, which he established all those years ago and how proud he must be to eat the food prepared by his son, continuing his legacy. 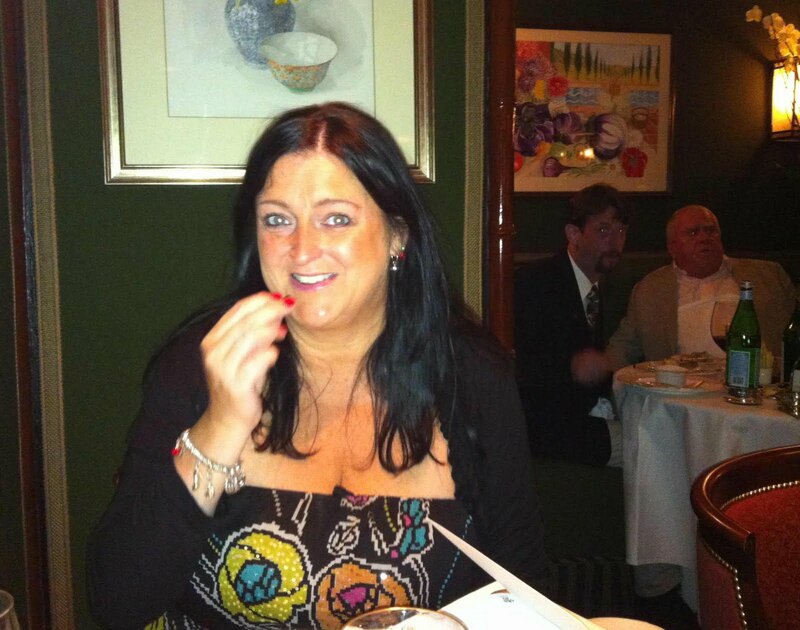 My wife, and Albert Roux in the background. The real majesty of Le Gavroche comes not just from the old school luxury of the dining room but from the flawless service and fabulous food. I am not going to go into detail about every aspect of the menu. Suffice to say, each dish, both my wife’s choices and my own, showcased the finest produce, and were, as you would expect, cooked and seasoned to perfection. 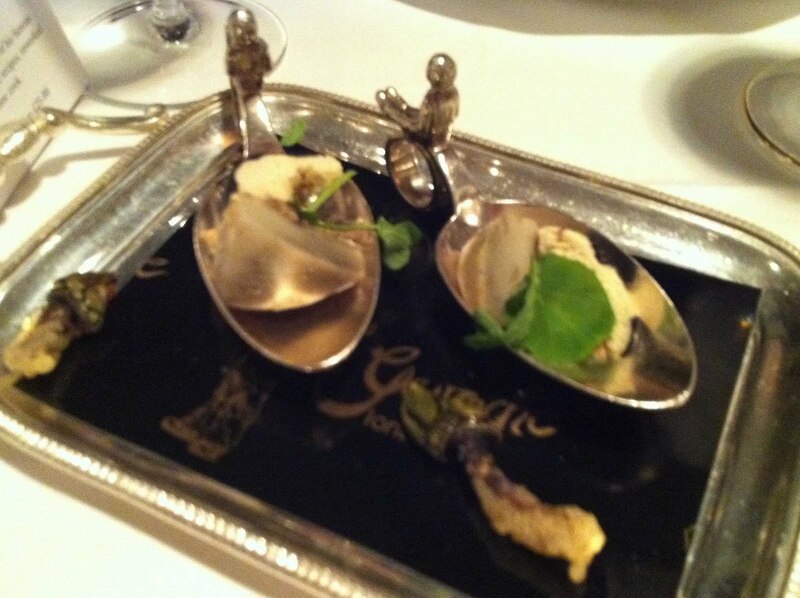 Our first amuse bouche, served on the bespoke Le Gavroche cutlery. One stand out memory was the lemon, honey and mustard dressing on the second of our amuse bouches, which was simply divine! Naturally, I have had this classic flavour combination many, many times but the balance between the flavours on this occasion was wondrous; the bitterness of the lemons, the sweetness of the honey and the sharp heat from the mustard working in perfect harmony – simple, masterful cookery. 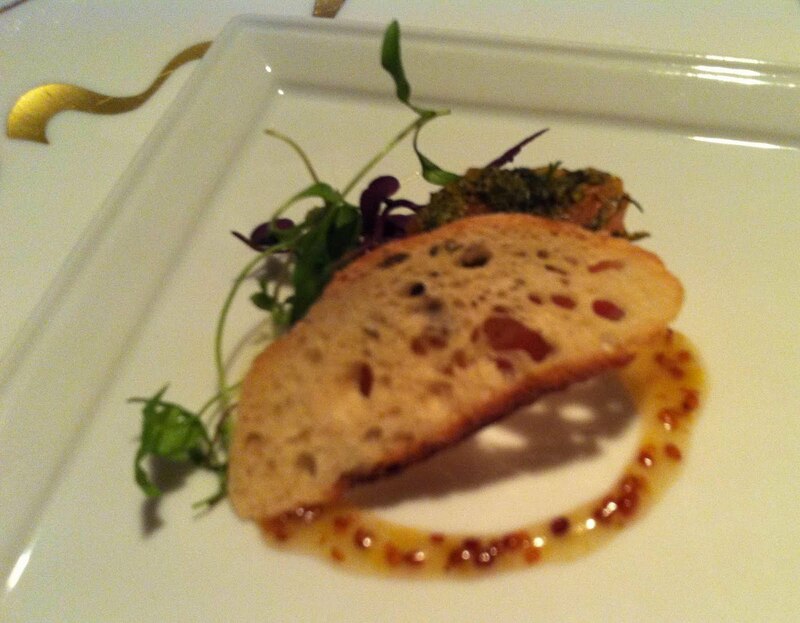 The smoked salmon amuse bouche featuring an amazing lemon, honey and mustard dressing. Another outstanding dish was the Médaillon de porc grille et jus lié a la páte de coing: top-notch, quality pork medallions, teeming with phenomenal flavour. Possibly the best pork I have ever tasted! (The other pig in contention was the one I ate at Northcote Manor). Médaillon de porc grille et jus lié a la páte de coing. 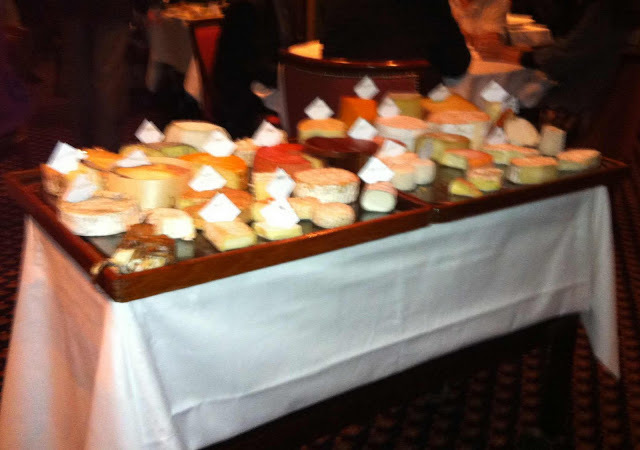 Another amazing part of the meal was my Plateau de fromages – the cheeseboard was the largest and most comprehensive I have seen in any restaurant. After much deliberation and feeling like a kid in a sweetshop, I chose five French cheeses. A Crottin and a fine Camembert au Calvados caught my eye; I then opted for two of my favourites in a Beaufort and a Livarot. My fifth and final choice was a cheese, which I have never tasted before, Boulette d'Avesnes - conical shaped with a soft and crumbly texture, ensconced in a rusty-hued beer-washed rind, flavoured with paprika. The cows milk curd itself had an intense herby flavour; predominantly tarragon with peppery and parsley notes and a hint of cloves. I’ll definitely keep an eye out for this one in the future – an intriguing cheese to have on any cheeseboard - a real find. Les oeufs d’oie brouillés biodynamiques ed homard tiede. 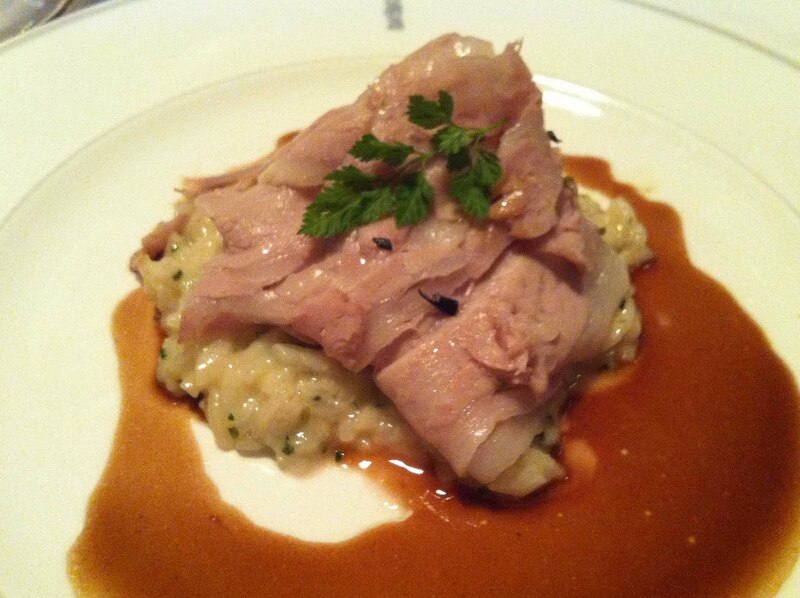 Émince de veau et risotto aux herbes. 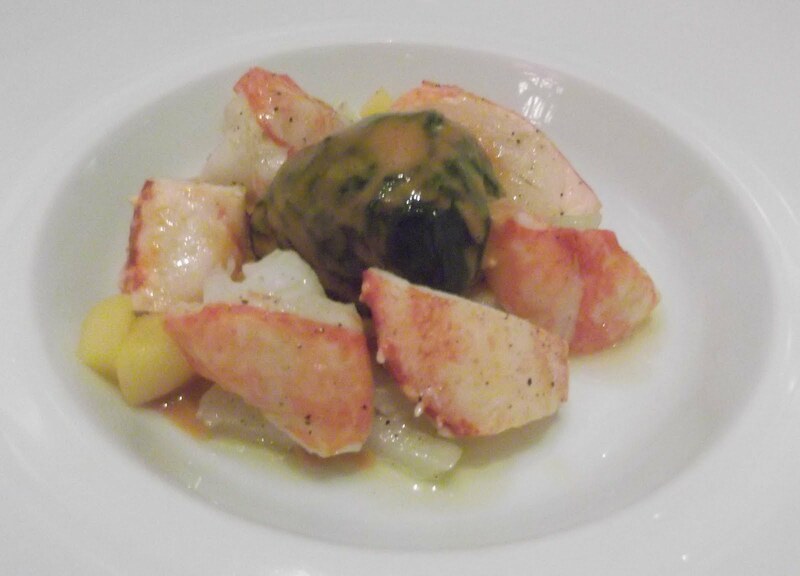 Pavé du saumon rôti, pommes écrasée et jus de homard. Petit fours and Soufflé aux pêches et crème a la vanille. 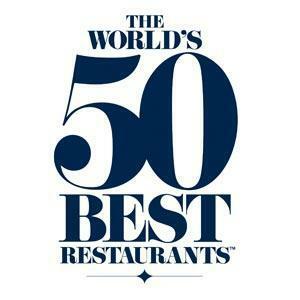 Le Gavroche has ranked as high the Restaurant Magazine's 22nd Best Restaurant in the World (2008).